This 1400VA UPS is perfect for alternative energy projects. The UPS is also rated for 100% duty cycle (unlike none XL UPS). This means that the UPS is designed to take the thermal stress of running on battery power for extended periods. Its a purely cosmetic issue and does not affect performance at all. I have pallets of these new batteries and have unwrapped and installed them myself so I know they are right and can guarentee they are brand new. You might have heard the scare stories about the price of replacement batts for these units. Unit needs special leads to operate (C19) and hot to cold cables. I supply these with the UPS as standard. The ups is ready to use from the moment you unwrap it. There is no issue with needing to test the performance of the batteries as they are brand new (will run for 2HR 20Mins upwards at 300 watts), and the UPS are all throroughly tested themselves. A final heavy load power failure simulation concludes the tests and then the UPS is deemed ready for service. As you can see from the pictures I have LOTS of UPS and do this day in day out, so if you need a UPS solution, drop me a line. The cosmetic condition of the cases is A-Grade (retouched paint where neccesary, no major bangs / dents). Basically this means that the ups is second user so its not exactly as it would be as new, but its near as damn it. Includes power cable and 2x hot to cold cables to plug your devices in. Item is heavy so you will need to help the TNT driver unload the item. Courier insured 24HR With TNT the best and most reliable courier (though a little dearer, its worth it as you DONT want an item like this mashed around in transit). People tell me my packaging is excellent, and I have very few problems. Max Configurable Power 2200 VA Output Voltage Distortion less than 5% at full load Crest Factor up to 5 : 1 Waveform type Sinewave Maximum height 9 inches (22 cm) Maximum width 19 inches (48 cm) Maximum depth 18 inches (45 cm) Rack Height 5 U Net weight 126 lbs. (57 kg) Online thermal dissipation 375 BTU/hr Control panel LED status display with load and battery bar-graphs and On Line : On Battery : Replace Battery : and Overload Indicators Audible alarm Alarm when on battery : distinctive low battery alarm : configurable delays. Plesase note some of the below pictures show 2200VA models. This listing is for the 1400VA model. 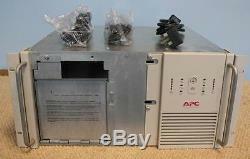 The item "APC 1400 RMXLINET UPS +NF+ New Batts 1YR Wty" is in sale since Thursday, May 8, 2014. This item is in the category "Computers/Tablets & Networking\Power Protection, Distribution\Uninterruptible Power Supplies". The seller is "ups-trader" and is located in Stockport, Greater Manchester. This item can be shipped worldwide.